As product development becomes more involved so do the teams and individuals who comprise them. 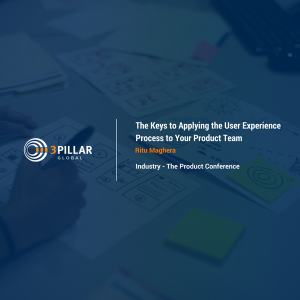 Although you can purchase tools and apply methodologies like Agile and User Testing to your process, each team still needs to find the best balance of how each individual’s expertise best come together to create the final thoughtful and innovative product. There are a few key things that make for a winning team and some things that you may not even realize are hindering the process. The more involved and specialized product development becomes, so do processes that comprise it, such as design. There are new tools and technologies everyday that support all aspect of product development, it is almost impossible to keep up. Here at 3Pillar Global we usually just do a quick questionnaire or survey to our teams to see if there is anything new tools and services worth making the investment. But the tool does not make the product, although there are tools like sketch and invision, you still need UX ideation and UI design knowledge to best utilize the tool. If a tool will not positively and directly impact your solution, move on. There is be a newer and better whatever it is, when you actually need it. The UX process itself can be tricky, because creativity cannot be forced, so the best thing is to allow space for the magic to happen. Unlike code & logic, in the brilliant chaos of design, a + b does not always equal c. And nor do we want it to; if it did then where is the innovation? If everything had the same answer without variation, you would not need research, user testing, & prototyping. As a product manager the last thing you want to do is interrupt that ahha moment so knowing when to step in can get tricky, but keeping the inspiration targeted is incredible valuable for a designer to stay focused. The challenge in UX is knowing when to apply the appropriate research methodologies and empathy to anticipate a particular user’s behavior as User Experience (UX) and then applying it to a comprehensive visualization in the User Interface process (UI). Knowing what to standardize and implement as a process is determined best by understanding how each team works best and the capability that is being delivered. Although you cannot force creativity, you can capture innovation. If you already went through a creative process to determine a successful solution, capturing allows you to apply to the same successful solution again without the learning curve of the first time. For example a data visualization dashboard. If you have gone through the challenge of having to create a visual solution for a particular client, the same research methodology and discovery process can be applied to the next client. Even though the information received and dashboard itself are unique, some aspects of the research discovery can be streamlined. Every time you create this solution, you have to tailor it the new audience, but it won’t have to be from scratch. In-order to avoid pitfalls, it is important to allow each area of the project to do their own thing while in the trenches but regroup and come up for air. Agile and sprint meetings allow you to do that, but you also have to mentally step back and let trust the decisions make as a group. People are very visual thinkers, especially these days where we are exposed to digital interfaces, the more we all think of ways to improve them. Although everyone’s insight is valuable, you have to trust certain design decisions and not get stuck down a rabbit hole driving all your energy into a visualization that may or may not add business value. The challenge is when to apply the best and most feasible design decision that matches requirements in a realistic timeframe. In other words, make the best decision, for now, and move on. The importance of good design is knowing certain needs and trends will uncontrollably and unpredictably change and to allow room for improvement while continuing to move forward. As product teams grow and become stronger, it never hurts to just have an open dialogue outside of sprints and planning meetings. All of the passion, energy, expertise and perspective each person brings to the table so each individual perspective should be heard. This is what allows for that unique balance that creates the perfect creative space for innovation. Ritu Maghera is a Senior UX Designer for 3Pillar Global. She has over 10 years of experience in Web UI, UX Design and Development, Information Architecture, and Brand Management. She specializes in developing user-friendly and audience-conscious web and digital applications.